In a recent NYT article, ‘Isn’t that the Trump Lawyer?’: A Reporter’s Accidental Scoop, Vogel provided a blow-by-blow account of his encounter with the two Trump lawyers. 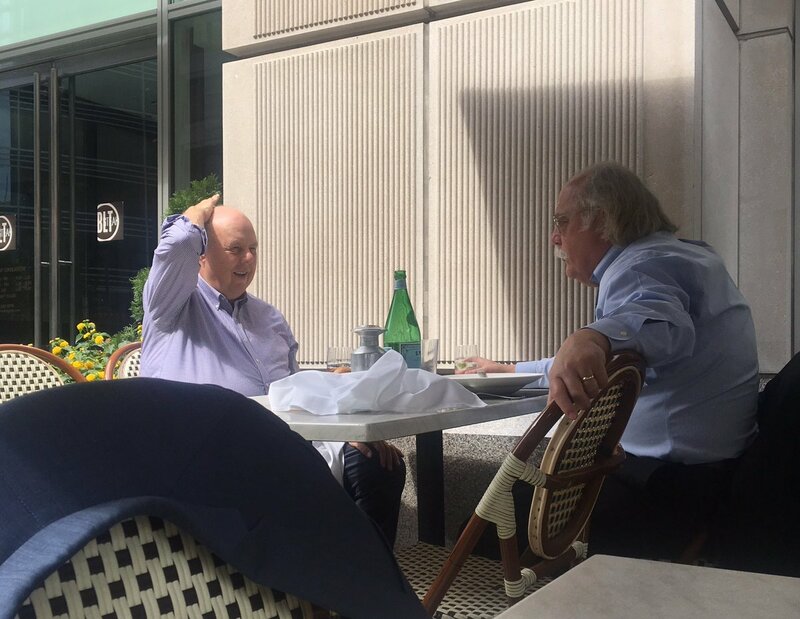 He met a source at BLT Steak for lunch and, shortly after ordering, the restaurant seated Messrs. Dowd and Cobb at a table directly behind Vogel. The immediate result was twofold. First, Vogel’s NYT article, Trump Lawyers Clash Over How Much to Cooperate with Russia Inquiry, detailed an internal debate between Mr. Cobb and White House counsel Don McGahn regarding whether to produce or withhold certain documents requested by Director Mueller’s office. Second, reportedly Mr. McGahn “privately erupted” at Mr. Cobb, and Chief of Staff John Kelly “privately reprimanded” the reported Georgia Peach descendant for discussing legal strategies in a public place. While the national press will surely have fun with this event, legal implications could also arise. If Director Mueller subpoenas documents and the President invokes the deliberative-process privilege or the presidential-communications privilege, can Mueller claim that the non-confidential Cobb–Dowd conversation about producing presidential documents—and whether to invoke the executive privilege—constitutes privilege waiver? Courts apply a limited-waiver doctrine in the executive privilege context. New York Times v. Dep’t of Justice, 756 F.3d 100 (CA2 2014); In re Sealed Case, 121 F3d 729 (CADC 1997). But you can bet that Mueller’s office is researching the scope of any waiver, and this could develop into a fully litigated issue. Time will tell. For more information on the executive privilege, including a break-down of the privilege’s subcategories, see General Sessions and Executive Privilege and Trump, Comey, and Executive Privilege. In addition to national implications, this episode provides ethical and privilege-related lessons for all lawyers. First, Model Rule 1.6 imposes an ethical duty on lawyers to keep their client’s information confidential. The ethical confidentiality mandates are broader than—but certainly include—privileged information. For a discussion of how one lawyer received a private reprimand for disclosing privileged information, see Lawyer Discloses Privileged Info Without “Difficult” Client’s Consent—Here’s How the Ethics Board Responded. Second, lawyers should avoid having privileged discussions in restaurants, coffee shops, bars, and similarly public places. Conducting a privileged conversation with a client or discussing privileged information with a lawyer colleague in a public place may result in privilege waiver. For more information, see Meeting Client in Coffee Shop? Be Wary of Privilege Waiver. We may think that a lunch table or a corner seat at Frothy Monkey is sufficiently private, but why take the risk? And it doesn’t take a NYT reporter to invoke privilege waiver—any old soul will do.